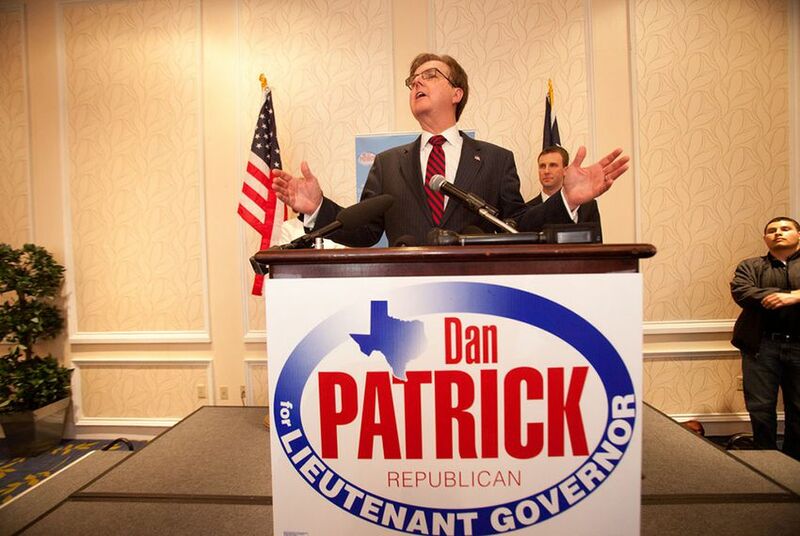 State Sen. Dan Patrick has credited his success to grassroots support. But the Houston Republican's momentum has also been built on lessons learned navigating the old-school politics of Harris County. Almost eight years ago, before he became a state senator, Dan Patrick was known around the Texas Capitol as the Houston talk radio host who had once shouted down a powerful committee chairman in the middle of a legislative hearing. Now Patrick, a Republican, is in prime position to control its most powerful post. He is the front-runner in a Republican primary runoff for lieutenant governor in May after a primary in which he finished 13 points ahead of the incumbent, David Dewhurst, who received just 28 percent of the vote. The runoff winner will be a strong favorite in the general election against state Sen. Leticia Van de Putte, D-San Antonio. If Patrick succeeds Dewhurst, who has held the office for 11 years, it would begin a new era in a state Senate, where Patrick’s flair for showmanship and populist appeal once branded him as an outsider. But his momentum has also been built on lessons learned navigating the old-school politics of Harris County, where he has aggressively courted a small number of influential conservatives. Among Patrick’s foremost backers is Steven Hotze, a Houston doctor and Republican donor, who like Patrick is a longtime client of Allen Blakemore, a political consultant. Hotze’s political action committee, Conservative Republicans of Texas, distributed an estimated 1.2 million mailers promoting Patrick among a slate of candidates during the 2014 primary in all but eight counties in the state. According to campaign finance filings, Patrick spent $50,000 each on advertising in the state’s two other largest Harris County-based slate publishers — the Link Letter and the Texas Conservative Review, which both mail their lists to primary voters statewide. Such methods have drawn criticism for what is perceived as a “pay to play” approach, in which candidates donate money or pay for advertising in exchange for an endorsement. His group, which has not endorsed anyone in the lieutenant governor’s race, has attempted to combat the influence of slate cards in Harris County by putting out its own mailer that is not paid for by political contributions. Gary Polland, who has published Texas Conservative Review for 13 years, said he allowed candidates who are not endorsed by the group to pull their ads and get their money back. He said that he had chosen to endorse Patrick after lengthy meetings with both the Houston senator and his opponent. Polland said he was impressed by Patrick’s willingness to talk about concrete issues facing the state. Blakemore said he believed the endorsements played a “key role” in delivering Patrick’s margin of victory on primary night. While Patrick appeared early on to be Dewhurst’s toughest challenger in the four-man Republican primary race, many political observers believed he would struggle to build name identification outside of Harris County and with the logistics of running as a statewide candidate for the first time. But even a steady stream of attacks from his opponents — including claims of dishonesty from other candidates in the race, and reports about undocumented immigrants who had worked in a chain of sports restaurants he owned in the 1980s — failed to curtail Patrick’s strong primary showing. An early sign of Patrick’s talent for leveraging popular support came in the aftermath of his 2003 standoff in the committee hearing. Hill, who declined to comment for this article, said at the time that he had allowed seniors and witnesses with disabilities to speak first so they could avoid the several hours of waiting it would take to get to their testimony. Patrick, who walked out after his outburst but later returned to the hearing and testified, maintained that he acted to ensure citizens would have their voices heard. A decade later, Patrick defended himself in a similar manner when a feud erupted between him and a fellow state senator, Tommy Williams, R-The Woodlands. Williams, who led the upper chamber’s finance committee until he resigned last year, accused Patrick of taking an unexpected vote against the 2013 state budget to help his campaign for lieutenant governor. When Patrick later said his vote was because of a lack of funding in the budget for some public education programs, Williams, who also declined to comment for this article, wrote a column published in The Texas Tribune challenging his comments. Patrick promptly issued a statement defending his choice as what was right for the people of Texas.